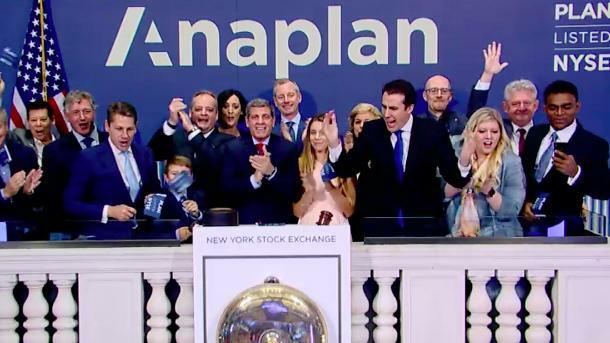 Strong growth and stock prices hitting a new IPO high are clear signs that Anaplan is proving it’s connected planning services are expanding to more businesses and helping transform the way companies make strategic decisions. Started in 2008, Anaplan offers cloud-based planning software across finance, sales, supply chain, operations and human resources. The business released its first planning product in 2011 and by the start of this year, their revenue has exceeded $240 million. Anaplan is within a market that has been valued by IDC to be in the region of $17 billion, predicted to rise to $21 billion by 2021. There are reported to be over 70 million workers that are planning software users. Anaplan has replaced many traditional systems that have been incapable of interacting with other services and has removed the manual planning that quite often is complex, expensive and lacking efficiency. Anaplan is capable of managing large data volumes processed in real-time. The system enables thousands of users to have access to a centralised data system, incorporating all levels of data enabling better decision making. There are a number of ways Anaplan services can be used within a business. This includes budgeting and forecasting through to modelling and pricing measurement. Anaplan planning tools can be utilised to measure sales, manage department budgets, marketing spend and handle technology project budgets. Anaplan tends to focus on securing agreements with large enterprise accounts. As of this year, Anaplan had close to 250 accounts with an annual yearly payment of over $250,000. The enterprise market is highly lucrative for Anaplan, resulting in the average contract value being just over $200,000, significantly higher than competitor Adaptive Insights, now Workday, which stands at $27,000. Anaplan went public last year with opening trades at just over $24 and reached a post-IPO record high of just over $40 earlier this year. Data reports have also proven to show a significant rise in overall revenues at Anaplan. During the last quarter, the average size of the 10 biggest deals at Anaplan was greater than $500,000. The partners at Anaplan are an essential part of the company as they drive new business, particularly within the larger enterprise sector. Anaplan now employs over 1,000 consultants and it is recorded that nearly half of all deals at Anaplan involve a partner. EY has become a major partner for Anaplan, looking closely at supporting financial services companies and improving results through the use of the Anaplan platform. Anaplan has also worked with EY to provide a dedicated cloud spend optimisation system which identifies where money is not being used appropriately on cloud solutions and provides methods of improving the process. Anaplan has also collaborated with Deloitte to create a planning system targeting consumer packaged goods companies. The tool focuses on improving demand planning with an aim to ensure products are always available to the customer. This year, Anaplan intends to expand its sales team and continued to expand the product portfolio.